I will like to avoid the window "the file XXXXXX already exist, do you want to overwrite "
this happens when i modify a file even if in the first warning window, i click where it says never ask again. ShowSaveDlg to 130 it will not show again, true but it does not save the modifications when i scroll to next picture. I will really appreciate your help. i have been reading all possible solution in this board but nothing works. Last edited by ratonxnview on Wed Oct 01, 2014 1:09 am, edited 2 times in total. You mean add SaveAdvDlg=1, yes i did try with no luck. i got a warning window to overwrite ,like usual but this time with the option dont show this message again. 0: The dialogue'll remain disabled for the current session only. 129: The dialogue'll be displayed in all cases. 130: The dialogue'll never be displayed, even in the next sessions. “Never display this dialogue again” when a file is modified and closed. Since 1.90 ß-4. Allows a fine-tuning of the previous entry functions above by saving the state of the advice dialogue. Using it, you may avoid the unwanted “Overwrite” dialogue when saving a changed file only. • When XnView is closed ! Unfortunately I'm very busy right now, but I'll try to do some tests on the weekend. BTW: What's the value of ShowAgain in the [Start] section of your xnview.ini? Rotation and confirmation of save changes. 1.90.2 - always appeare "Save changed File?" How to make xnview never ask about saving? Turn off "save changes" confirmation. Turn off "confirm on overwrite"? … and can confirm your observations, rafael. Peter's report ("Save as.." to existing file - two different alerts?) may also be related. I did read all the links you had provided with no luck. nothing i could do . be possible to just load this working ini file on my system, or is this too personal or technically no viable. If he confirmes that there have been changes or that this is a bug, he'll fix it in the next release. » Save changed file: Do you want to save changes to 'test_1.jpg' ? Tick the checkbox for Never ask again and confirm with Yes. » test_1.jpg is saved and test_2.jpg is loaded into the viewer. 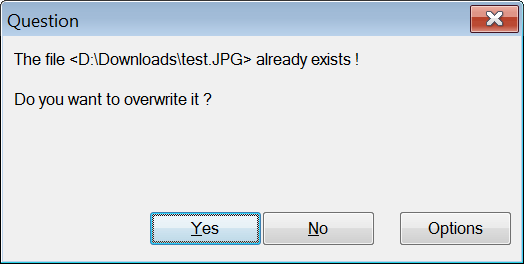 » Question: The file 'test_2.jpg' already exists ! Do you want to overwrite it ? Expected behavior: XnView should only ask me once per session if I'd like to overwrite the existing file. *********** IS WORKING NOW !!!!!!!!!!!!!!!!!!!!!!!!!! I was working today and to my surprise it works. work on a pic, then got the window " do you want to save changes to xxxxx ? . tick the box never ask againg, load next pic, work on it, load the next one and ...... no window at all. check if changes were made and yes was saved. I don't know what solved the problem because i did try with many of the options i was told. Here is what is in my ini. ratonxnview, could you please upload and share your .ini file?